This review is primarily about Nikon’s AF-S Nikkor 24-85mm f3.5-4.5G ED VR, throughout we will refer to it as the ‘VR lens’. 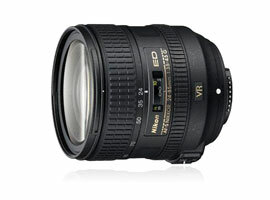 We will also talk about its predecessor the AF-S Zoom-Nikkor 24-85mm f3.5-4.5G IF-ED, which we will refer to as the IFED. The IFED is now discontinued but is still available in some places and of course second hand. A decade has elapsed between the launches of these two lenses but the specification and performance are little changed other than that the new lens has had ‘Vibration Reduction’ built into it. Both lenses are built to cover full frame 35mm, they will also work on Nikon’s APS-C (DX) bodies giving an effective focal length range of 36mm-127.5mm. The optical designs, though similar are not the same: the IFED lens had 15 elements (including one aspherical), in 12 groups while the VR lens sports 16 elements (three of which are aspherical), in 11 groups. Both include one ED (Extra-low Dispersion) element. The old lens utilized internal focusing (IF) which has not been carried on in the new lens, but it does, as we mentioned have Vibration reduction: Nikon claim a four-stop advantage for its VRII system, allowing for hand-held use in very low light. The VR version of Nikon’s standard zoom is being sold as a kit lens with the D600. 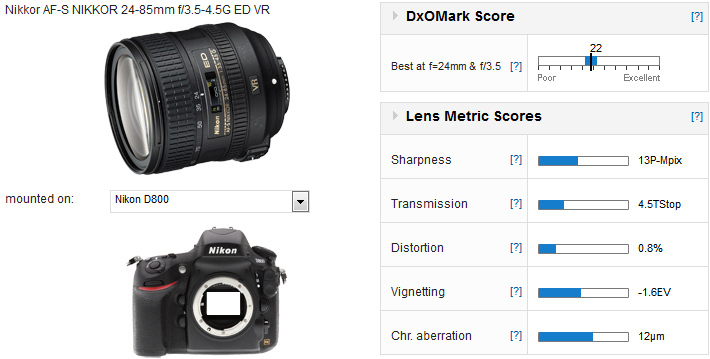 At the time of writing, the lens has not been measured on the D600 so the scores all relate to the D800. The scores achieved for the D800 suggest that in this case the lens is the limiting factor in the system so it seems fair to predict that the scores will not be much different when we test the lens on the D600. 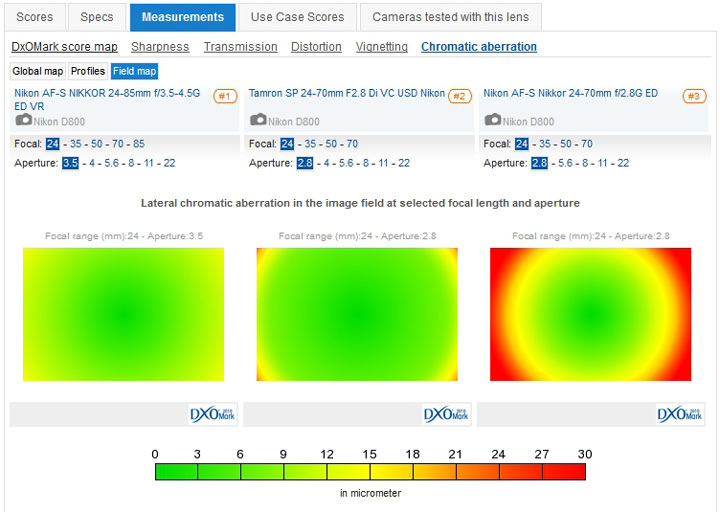 The DxOMark score for the VR lens is 22, just one point ahead of the IFED, sharpness is 13P-Mpix against 14, favoring the IFED while Chromatic aberration at 12µm against 14µm favors the VR lens. Looking at the various graphs the results are so close that you might think you were looking at the same lens. 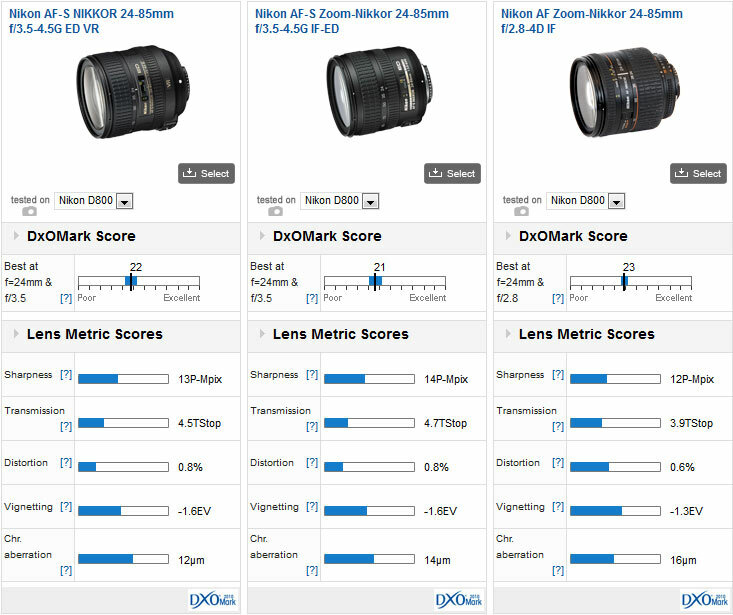 Generally, the scores are quite good, Chromatic aberration is well controlled and sharpness is reasonably consistent except for a dip at the edges between the 50mm and 70mm settings. However, the lens does vignette quite noticeably, losing over 2 stops in the corners when used at maximum aperture and at either end of the zoom range. Nikon has another 24-85mm lens, the AF Zoom Nikkor 24-85mm f2.8-f4D IF. With an extra half a stop of light coming through the brighter viewfinder image may be worth the extra 15% on the price tag but without the VR the advantage of the aperture is lost unless it is the shallow depth of field you are after. The f2.8-f4 lens is even older than the predecessor of the VR lens, having been launched in 2000. It does have a DxOMark score a point higher than the VR lens but on balance the quality is so close that the VR really makes the cheaper lens the better deal. Looking elsewhere the obvious comparison is with the professional standard zoom lenses that are available, specifically the 24-70 f2.8 lenses from Nikon and Tamron. First we should look at the price, the Nikkor f2.8 lens has an indicative price 3 times as high as our VR lens and the Tamron f2.8 is sits in the middle, just over twice the price of the VR. Is this price difference justified? 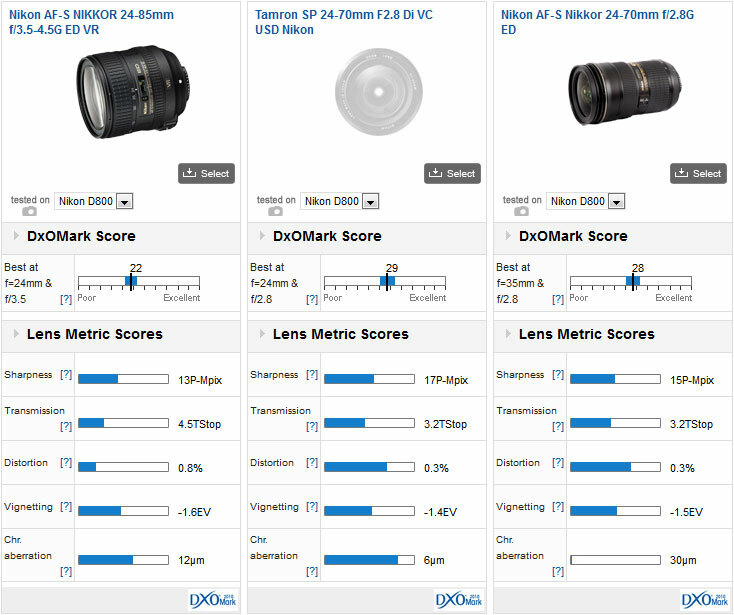 Well in part it is, both the 2.8 lenses are sharper, their DxOMark scores are 28 for the Nikkor and 29 for the Tamron. Both lenses control distortion better than the VR lens and have lower vignetting too and the Tamron has half the Chromatic aberration. The comparison is not wholly one sided though: remembering that the Nikkor 2.8 is the most expensive by far of the three it also has considerably more Chromatic aberration and in a very distinct pattern, falling off dramatically from about 12mm from the centre of the image. Processing through DxO Optics Pro would probably put this lens back in the lead of the three but the Tamron f/2.8 with Vibration Control, wider aperture, higher P-Mpix, lower distortion and less Chromatic aberration ‘Out of the Box’ would appear to be the one with the quality edge, if price is not too much of an issue. This is only one combination of aperture and focal length but regrettably for the Nikkor f2.8 it is representative. It is quite tempting to sneer at the concept of a kit lens; many of the ones bundled with cheaper cameras are really appalling, degrading the quality of the camera to the point where you are unlikely to get useable results. 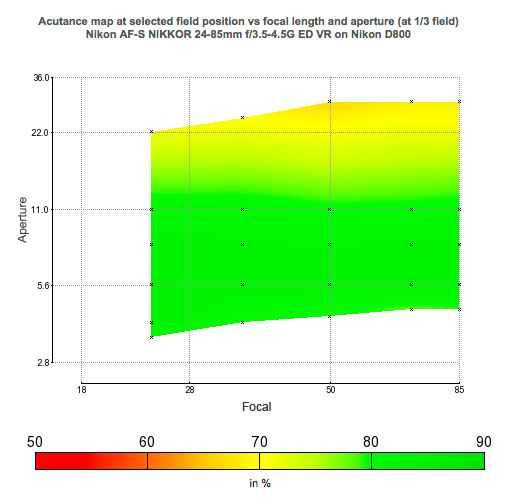 The Nikon AF-S Nikkor 24-85mm f3.5-4.5G ED VR is not like this, it is a competent lens that will provide results very much in keeping with the camera. If you are a purist and look constantly for the ultimate image quality then it is not going to match up to the best prime lenses. Neither will it match the very best of the Zoom lenses, but if you want a versatile, light, easy to use lens for everyday use on your Nikon D600 or D800 you could really do a whole lot worse than this.